While it’s not going to replace your job, mystery shopping can be a fun way to earn extra cash or get free merchandise, event tickets and food. And despite what you may have pictured, mystery shopping is not just going into stores and making purchases. Mystery shopping can include making phone calls, shopping online and even visiting a doctor’s office! Like most work from home gigs mystery shopping is rampant with scams. This can make knowing which companies to trust pretty confusing. To mitigate that confusion I decided to run a long list of companies through the Better Business Bureau’s website. 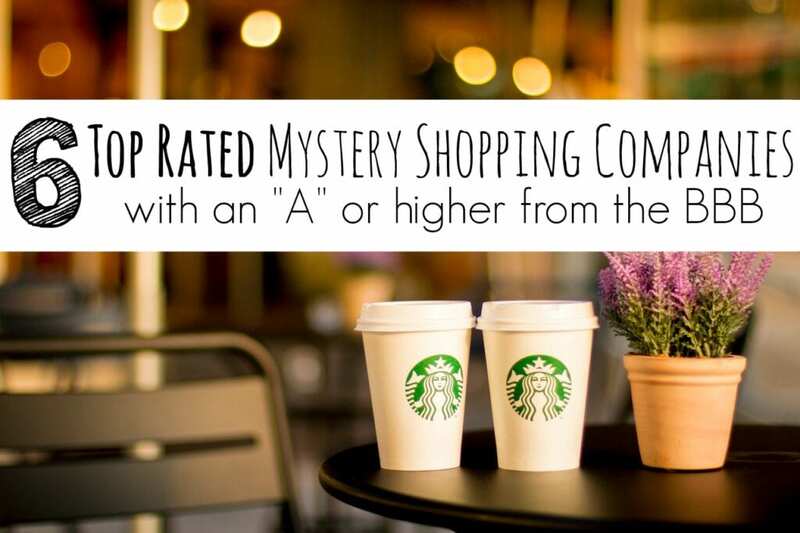 I came up with a list of six top rated mystery shopping companies with an “A” rating or higher. But first, a little refresher on mystery shopping actually entails. Each shop will have different criteria you need to meet. This is why paying attention to detail is the single most important trait a mystery shopper can possess. The more you demonstrate you pay attention to detail and have good written communication skills the more likely it is you’ll receive ongoing jobs. If you want to get started with mystery shopping the six companies below are completely legit. BestMark is a popular mystery shopping company whose clients are comprised of Global and Fortune 500 companies. They have work available in a variety of industries including, but not limited to, casinos, financial institutions, hotels, restaurants and retail stores. You can fill out an application (by state) to become a mystery shopper with BestMark here. Perception Strategies is a healthcare marketing and research firm who conducts mystery shops calls and in patient visits to doctor’s offices. As of now (June 2016) Perception Strategies isn’t actively looking to hire mystery shoppers for phone calls. However, according to their website if they believe you’d be a good fit they will contact you and save your information. Perception Strategies is hiring for in-person shops and observations in a number of cities across the U.S.
You can check to see if your city is on the list and to apply to be a shopper here. Quest for Best is a mystery shopping company working in many industries and doing many different types of shops. Most of the jobs with this company are available in the Southwestern and Midwestern United States. You can apply for a spot with Quest for Best here. Sinclair Customer Metrics provides mystery shops for restaurants, banks, retail shops and convenience stores. Sinclair offers telephone mystery shopping, in store shops, and video shops. You can sign up to be a shopper with Sinclair here. Secret Shopper has been in business for more than 25 years and works with everyone from start-ups to multinational business chains. You don’t need any previous experience to get started with Secret Shopper. They hire in the United States, Canada, Europe and the Caribbean. You can sign up with Secret Shopper here. Upon first look IntelliShop seems pretty impressive. The number of industries this company works with is in the dozens. They also do more than just standard in-store shops and often have assignments for phone shops and online shops. This company also has the best website for getting clear cut information on the exact process they use to hire and pay their shoppers. You can sign up with IntelliShop here. What if a Company Doesn’t Have a BBB Rating? If a company isn’t BBB accredited or doesn’t have a rating from the BBB it does not automatically mean the company isn’t legitimate. There are several reasons a company wouldn’t yet have a rating from the Better Business Bureau, including not having enough information on the business or not having enough time to assess the business. 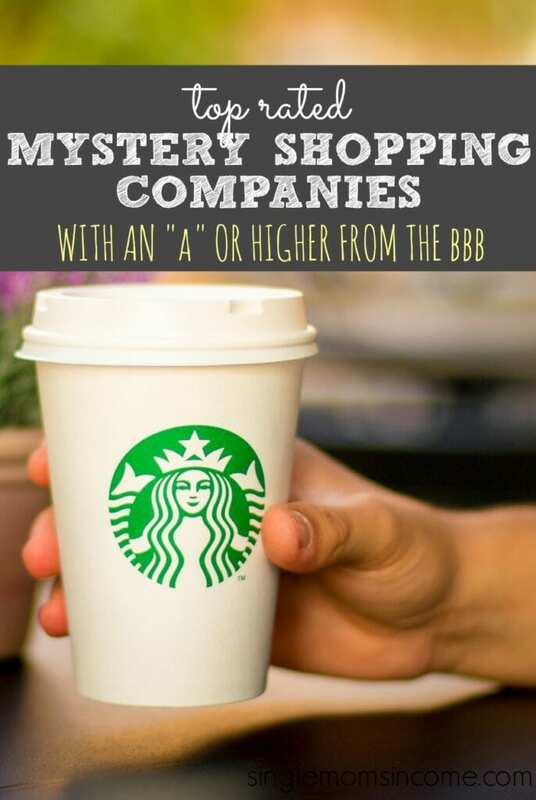 If you’re getting started with mystery shopping it may be wise to go ahead and start with one of these highly rated companies to get a feel for legitimacy. Have you worked with any of the companies on this list? Any you would add? I LOVE Bestmark. Back when I mystery shopped, I only used them. They were always great and they always paid! Great idea to check out the BBB ratings! I also shop for Caremark. Definitely legit. I check with MSPA and they have a list of companies they stand behind, as well. This is a great list! Definitely a smart idea to check out the BBB listings, but I agree that many legitimate companies are not “officially” BBB accredited. One example is A Closer Look. They are my absolute favorite company to work for because of the types of shops they offer and flexibility in scheduling. Definitely worth checking them out. They all pay through paypal so if you don’t want to use paypal you won’t be doing it. Besides, you don’t “lose” money through paypal. I do not use paypal. Had a bad experience with them. There are many companies that don’t require it. I would like to do this but I don’t have a computer to do what’s needed. It seems that is how it is with these companies. Yes, you will most likely need a computer to fill out the survey information after the shop. I’m a secret shopper and I only have an iPhone . I haven’t had a companies survey not work on my phone. If you have a smart phone you can be a mystery shopper. Hey Alexa, thank you for putting this list together. Do you know of any such sites for worldwide members? This will be ALL new to me. I have worked in the office field all my life, and just retired in February. I’m wanting to find something to get me OUT of the house ever once in a while. I going to try to check it out, but there are so many company of Mystery Shoppers out there, that I have NO clue where to start. If anyone wants to give me an idea, it might help. I have a comment regarding survey companies. I have signed up with Inbox dollars and swagbucks, what I don’t like is, if you want to earn say $5.00 you have to accept an offer they list, otherwise you don’t get the money. I excepted an offer with Amore Coffee through inbox dollars and the coffee company sent me coffee and wanted $68.00 for the coffee when I sent the coffee back for a refund I never got the $5.00 from inbox dollars because I didn’t follow through with the offer. Now why in the world would I buy something for $68.00 just to get paid $5.00 dollars? I don’t get it? How is that supplementing my income?? Am I missing something?? Yes….if you sign up for an offer you’re going to need to read the terms of the offer and cancel before you get charged. I personally stay away from the offers (unless it’s a 100% free one like using TaxAct to file my taxes, etc.) I use the search and survey sections the most. Although Swagbucks also has a bunch of other features you can use. Quest for Best is not a good company!!!!! They scammed me out of my pay fee and they owe me 65.00 for the shops I performed with Hollywood Feed. I sent Mr. Roam and his wife emails and explained they have not paid me. They used the shops. It has been almost a year and they have not paid yet. My next step is to call Hollywood feed and tell them I haven’t been paid. I did shops for them in Mississippi, Alabama, Tennessee. BE WARE OF QUEST FOR BEST!!!!!!! I even did Malco Theaters as well!! Report them to the BBB if they still haven’t paid you. I don’t know why the author of the article didn’t suggest this. The BBB will look into it, plus it leaves a record for others. I’ve been a mystery shopper for several companies over the last few years in the LA area – I’ve been doing mystery shops (restaurant shops) for Hospitality Checkpoint based in Arizona and I can say that I’m happy with them so far. What I like is that they pay on time and have helpful online tools that the others don’t have. I can often finish the report the same day, which really helps. I often take my daughter with me and we have dinner together at no cost, which is nice! No! Every time I’ve heard of anyone wanting you to do anything like this it’s a scam! You will end up owing that money to the bank from cashing the check or whatever it is and u send the money to them and then it comes back a bad check so you owe the bank and are out the money!! Biggest scam their is!!! Don’t do it!! Good list of mystery shopping companies. Secret Shopper is my favorite. I will give others a try. Thanks for sharing. Wao !!! Thank you for this info. Can I work with more than 1 company? I will try it!